Artful accessories you can wear all year, PilgrimWaters scarves feature graphic botanical prints by award-winning artist Susy Pilgrim Waters. Susy’s background in surface design fuses art and function, and her work has graced everything from high-end housewares to a mural in the NY public library. She commissions artisans in Kathmandu to hand weave superfine merino wool scarves and hand silkscreen one of her prints onto them. Reminiscent of a large painting or tapestry, a single, complete design takes up the finished piece. Soft and luxe, the fabric feels like a fine, lightweight cashmere. 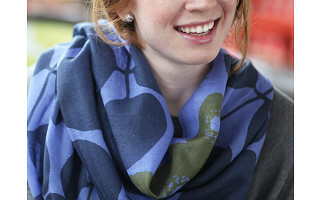 Generously sized, the scarves can even be draped over the shoulders as a wrap. And their slight sheerness pleasantly lets the print show through on both sides. 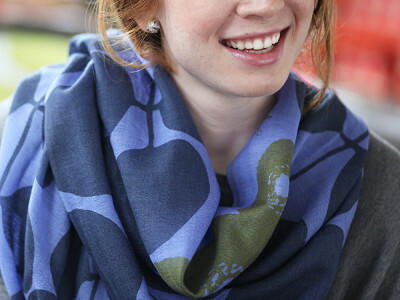 Each scarf features Susy’s signature as part of the silk screened pattern. It’s a fitting detail for a wardrobe addition that’s a wearable piece of art. Hi everyone, this is Susy, the other half of PilgrimWaters. I'm thrilled to show you my designs, and I'd be happy to answer any questions you have. Susy, the scarves are out of this world. Sooo beautfil. But so sorry to say they are out of my price range.But do keep up the good works. Thank you for your kind words of appreciation. The incredible quality of the merino is unique because each one is handwoven, hand dyed and hand printed. As you write sooo beautiful! The workmanship is extraordinary - making them works of wearable art. The scarves are an investment piece that add value to any outfit! Absolutely gorgeous and a pleasure to wear. Simply gorgeous! Can they be washed with a gentle detergent or must they be dry cleaned? @Ramona hello, what an astute question! We have to recommend dry cleaning, however they do wash very well in a mild gentle detergent then air dryed (not in a dryer). Lovely, fresh and natural. Thanks for your interest, we love a jolly good inquiry! Artful accessories you can wear all year, PilgrimWaters scarves feature graphic botanical prints by award-winning artist Susy Pilgrim Waters. 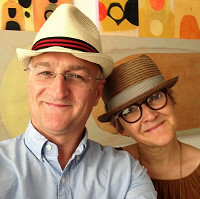 Susy’s background in surface design fuses art and function, and her work has graced everything from high-end housewares to a mural in the NY public library. She commissions artisans in Kathmandu to hand weave superfine merino wool scarves and hand silkscreen one of her prints onto them. Reminiscent of a large painting or tapestry, a single, complete design takes up the finished piece. Soft and luxe, the fabric feels like a fine, lightweight cashmere. Generously sized, the scarves can even be draped over the shoulders as a wrap. And their slight sheerness pleasantly lets the print show through on both sides.